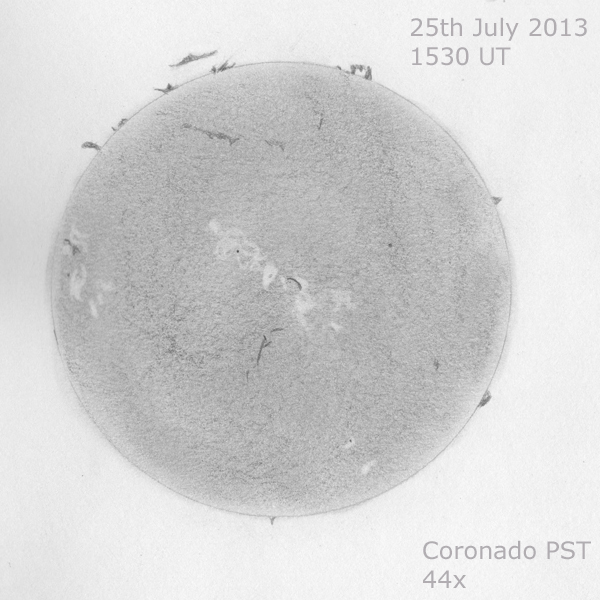 The detached horizontal prom was still there, although it had grown a bit fatter since yesterday. 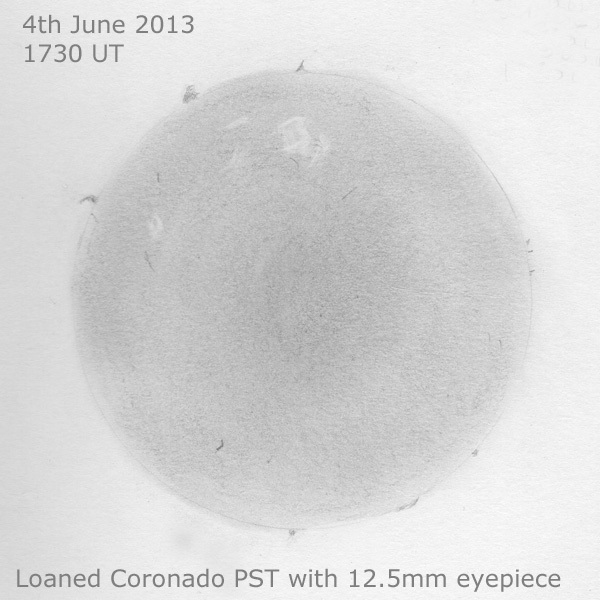 Sun is very nice and active with a lot to see today, in particular some nice prominences including a detached horizontal prom which was fascinating to see. 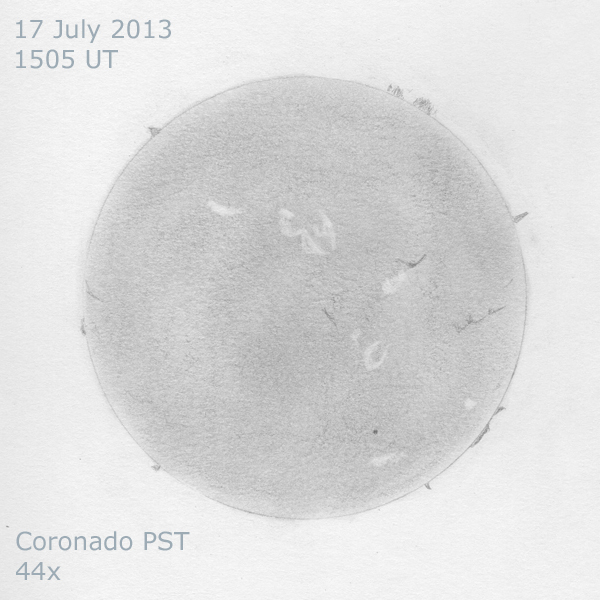 This is the first observing since July 19th, thanks to cloud, murk and doing other things. 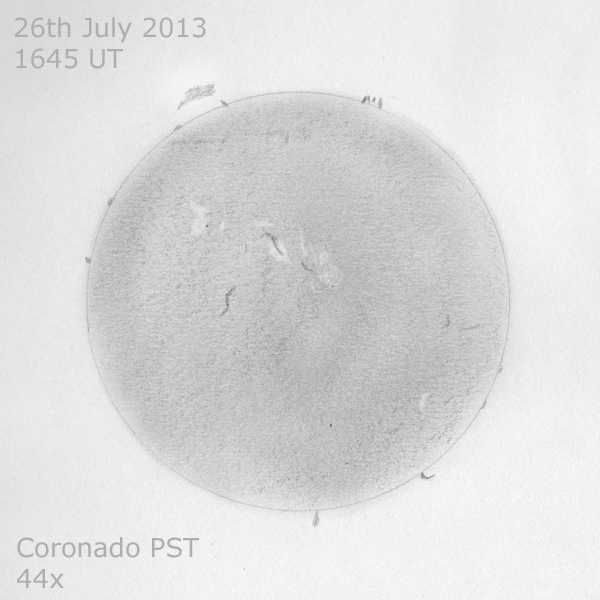 Conditions: The same – warm, around 28°C/82.4°F, sunny. 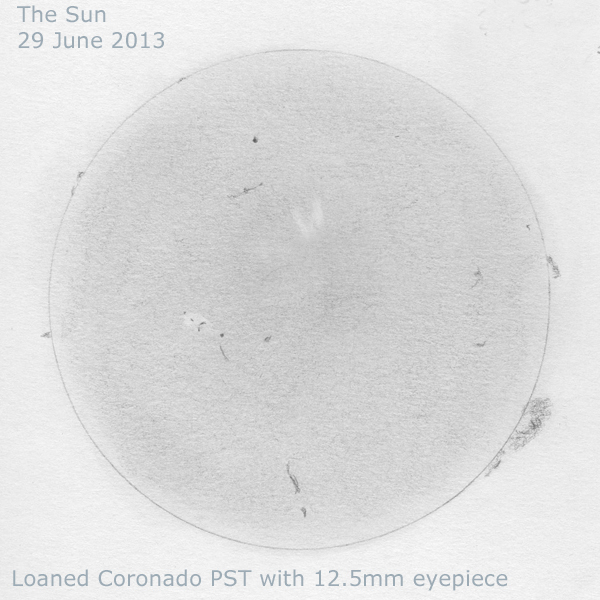 Conditions: As yesterday – warm, around 28°C/82.4°F, sunny but a bit hazy. 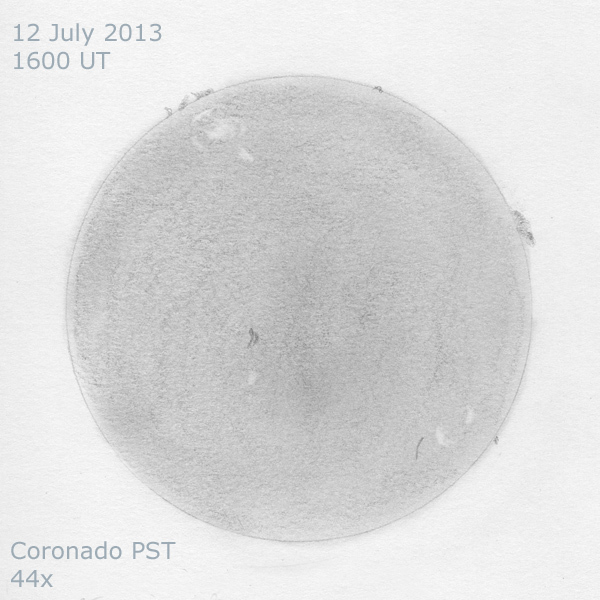 Conditions: Warm, around 28°C/82.4°F, sunny but a bit hazy. 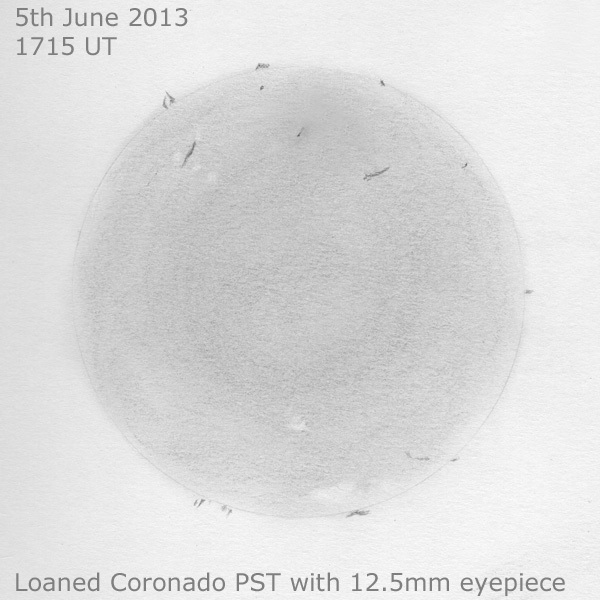 No observing yesterday, because high cloud wiped out all the detail, but today was a bit better. 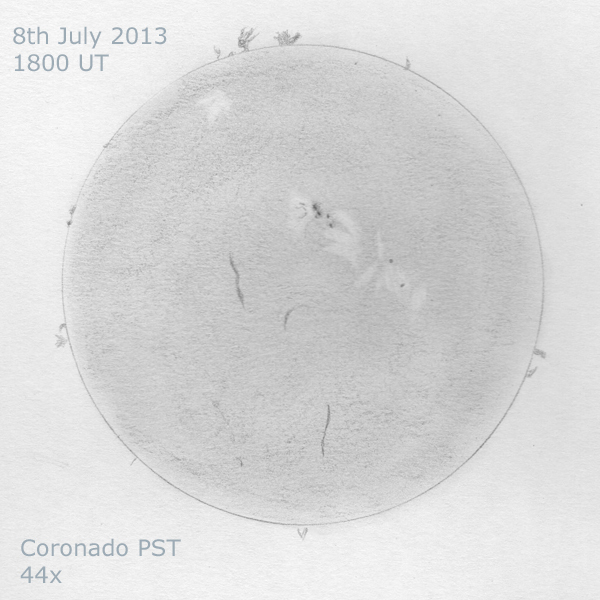 The Sun had some nice detail some nice hedgerow prominences, filaments, a few new spots and a nice-looking active region. 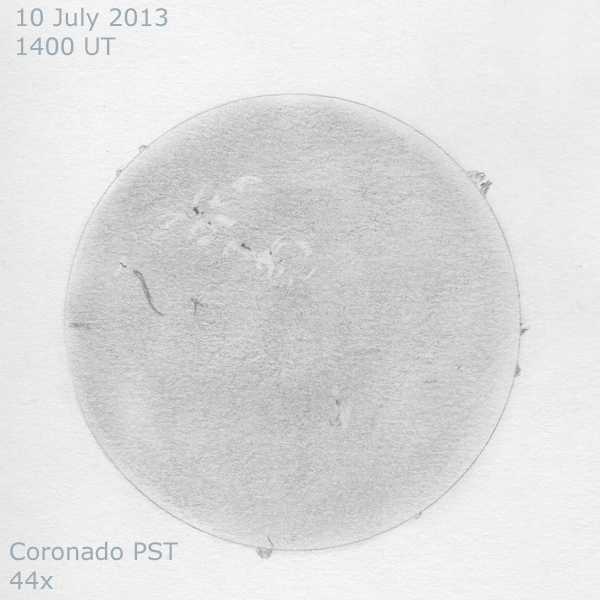 A pretty boring Sun today, not much going on but a nice loop visible. Conditions: Hot, hot, hot! Absolutely gorgeous, 32°C/89.6°F with the gentlest of breezes, no cloud although slightly hazy but, under the observing hood, it was a little too hot. Seeing was pretty turbulent. 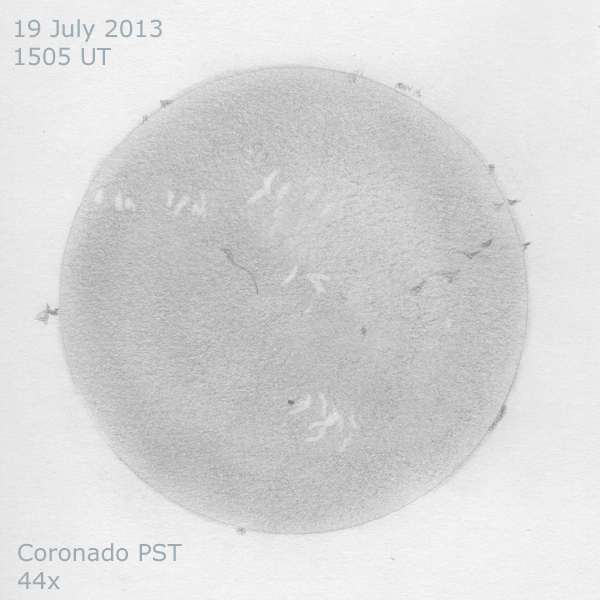 Again, the Sun’s surface wasn’t as ‘busy’ as of late, but there were a few filaments and some faculae. No spots. 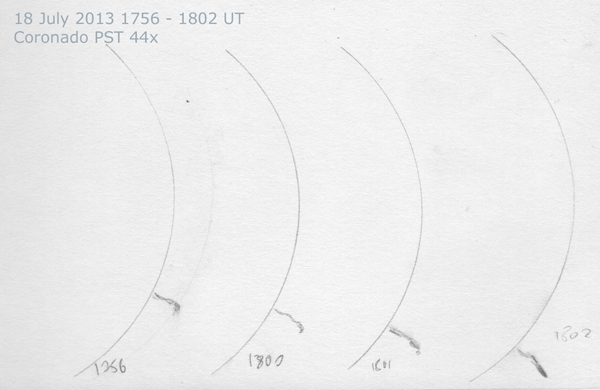 There were some small prominences and a large arch which was quite faint but which is drawn darker (brighter) than it really appeared. 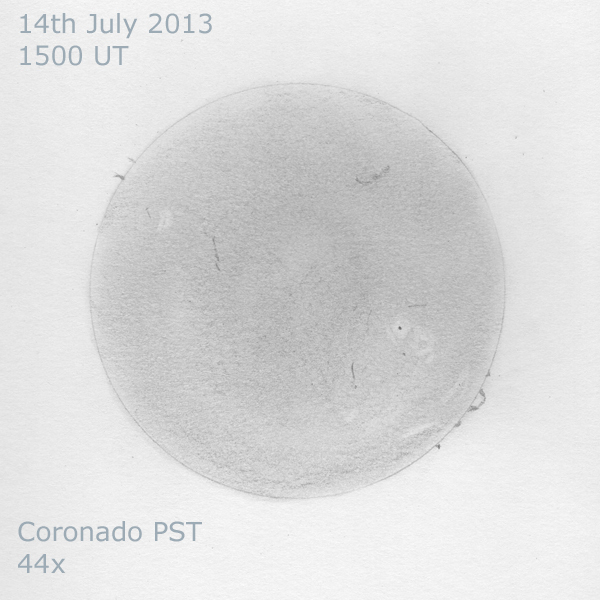 Conditions: Warm, the gentlest of breezes, no cloud but slightly hazy. 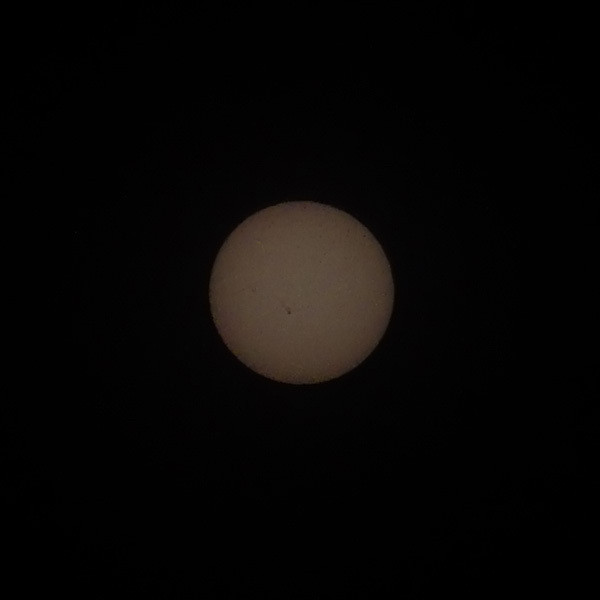 The Sun’s surface was a bit quieter than of late, it wasn’t so ‘busy’, that nice sunspot group from earlier in the week has dissipated/rotated out of sight leaving a couple of faint filaments and some faculae. 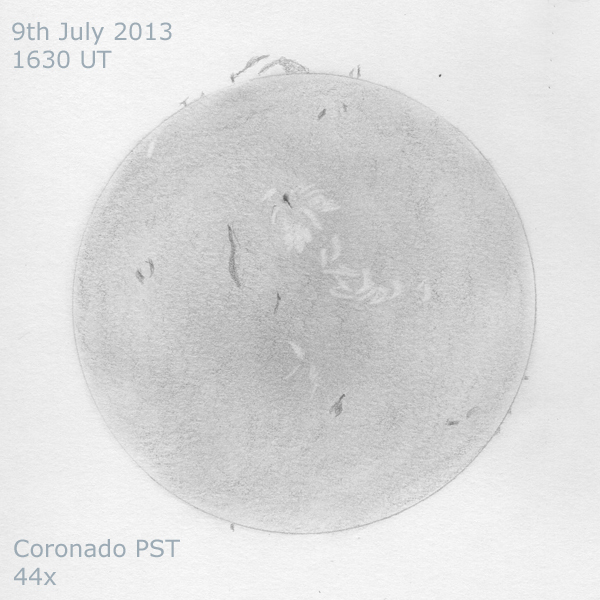 There were some faint prominences visible, including a larger diffuse one which was very faint and hard to see in the PST but I drew it darker than it really appeared. 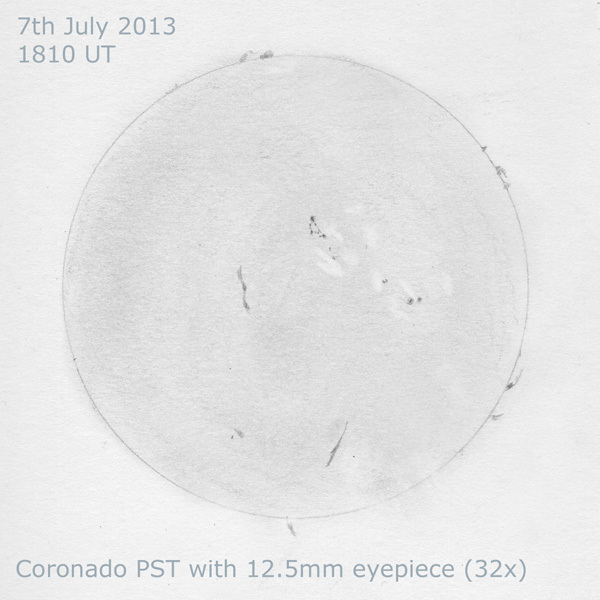 Encountered an unforeseen hazard of day time astronomy – a bird crapped on my notebook! Not nice but I cleaned it off best I could; better than on me, I suppose, but at least hair and clothes can be washed! I think I did a better job on the faculae today. 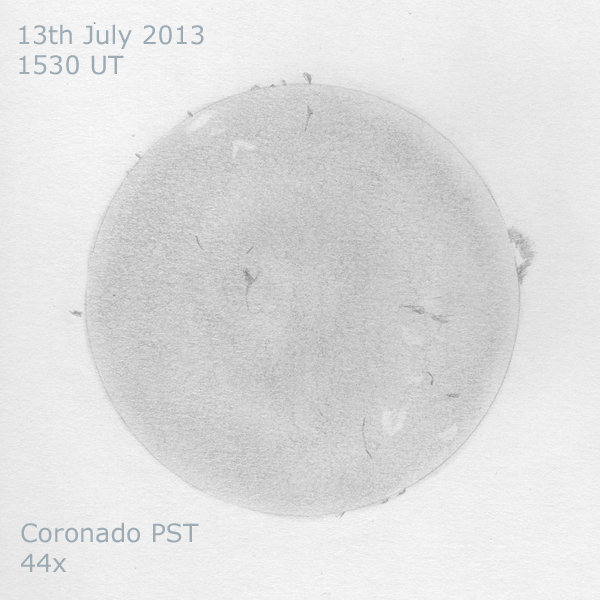 Conditions: Hot, around 29°C/84°F, clear. Seeing and transparency both very good. I’ve bought a new eraser, a retractable pencil-type, which is much better for rendering faculae. Conditions: The fantastic run of good summer weather continues, again warm and pleasant (but hot under the hooded observing vest! ), around 26°C, no clouds. Seeing fairly steady. I used a 9mm Nagler with the PST, rather than the old 12.5mm Orthoscopic I had been using, and the view was much better, bigger and brighter. 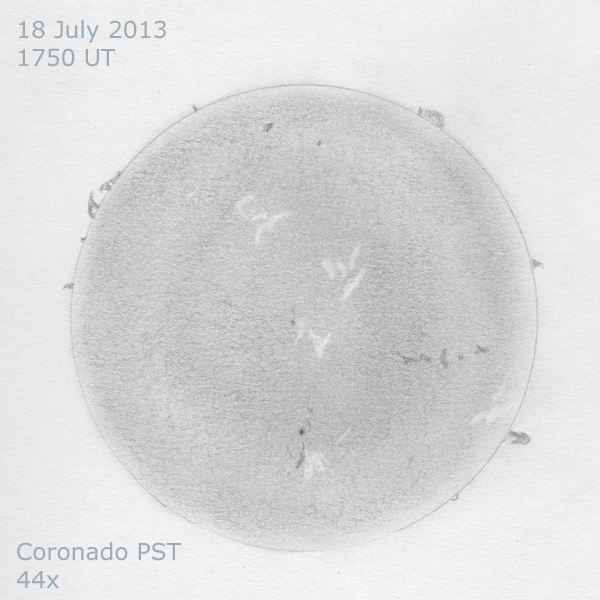 There is a nice group of sunspots, AR 1785 with neighbouring groups AR 1787 and 1788. 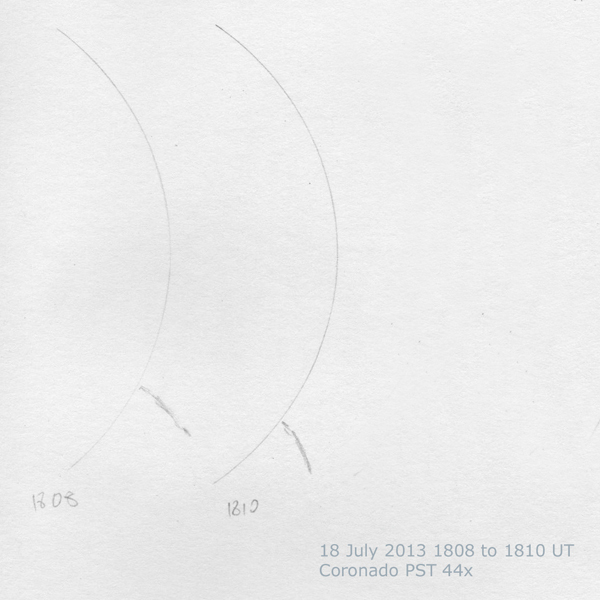 Conditions: warm and pleasant, around 30°C, no clouds. Seeing fairly steady. 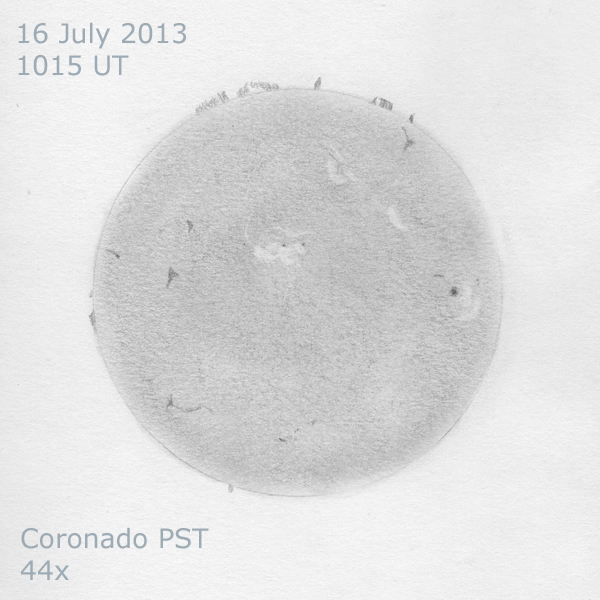 Nice sunspot group visible and some small prominences. Nice filaments on show, too. I also attempted to take a photo, with some old Mylar film and a Pentax superzoom camera. 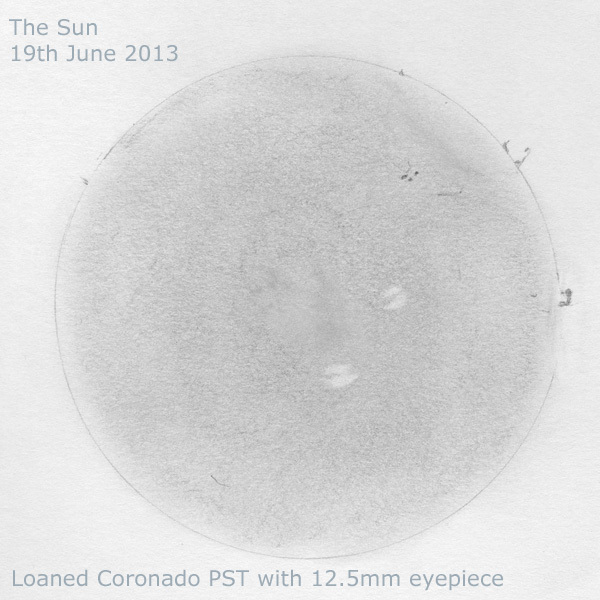 The results weren’t great but you can see the sun spot group. 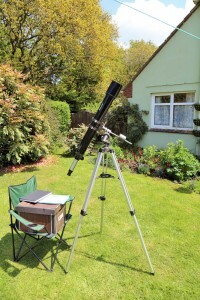 My observing fell by the wayside over the past three weeks, the sun’s been out a fair bit of the time but due to dire personal circumstances and critical illness of a family member put a stop to many other activites just recently. However, I managed sessions on 19th and 29th June and, as of 29th June, things with my family circumstances appear to be improving. Conditions: warm and pleasant, no clouds but there is an annoying breeze making it difficult to keep the scope and tripod stable. Conditions: warm and pleasant, a few fair-weather clouds in the morning. 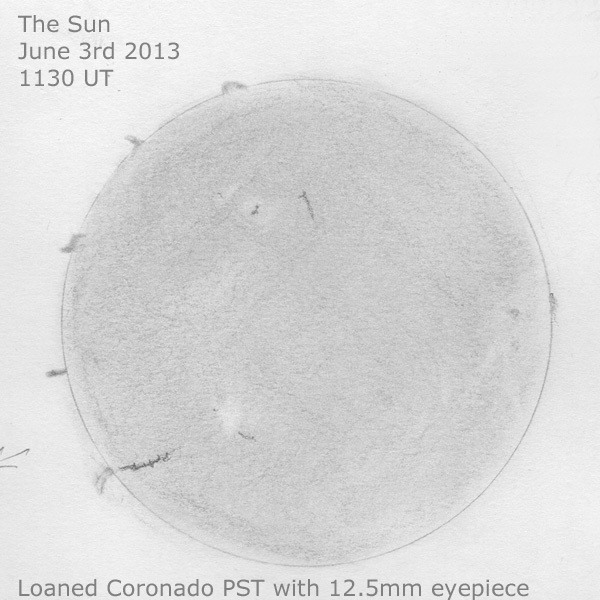 Here’s my sketch (the marks at 3 o’clock position on the disc are actually an imperfection in the paper). 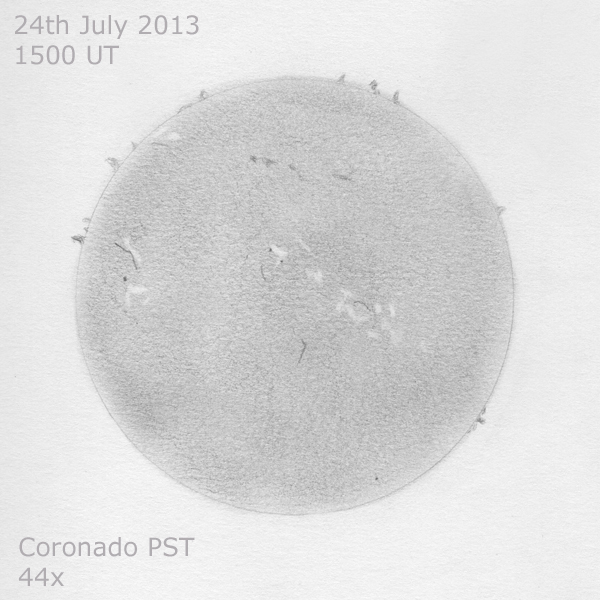 How exciting to see sunspots, faculae, filaments, granulation (and to me, the best of all) prominences and loops! 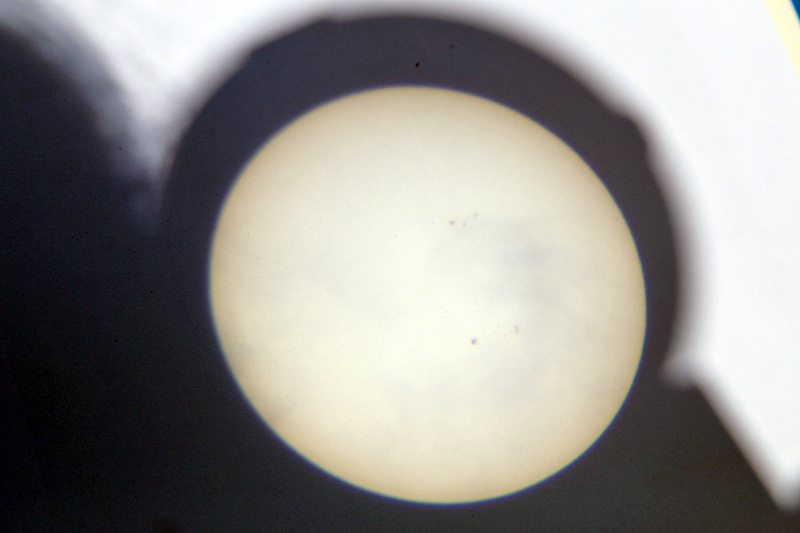 Nice collection of sun spots, the photo at lower right shows them as they appeared projected onto white paper and photographed with a DSLR. Click on the photo for a larger view.